The Carrier syllabary, or Déné Syllabics, was devised by Father Adrien-Gabriel Morice in 1885. He adapted it from the syllabic writing systems developed for the Athabaskan languages of the Northwest Territories of Canada by Father Emile Petitot. The Carrier syllabary was fairly widely used for several decades for such purposes as writing diaries and letters and leaving messages on trees. Though the syllabary is no longer used or understood by many people, there has been a recent revival of interest in it and it occasionally appears on plaques and memorials. 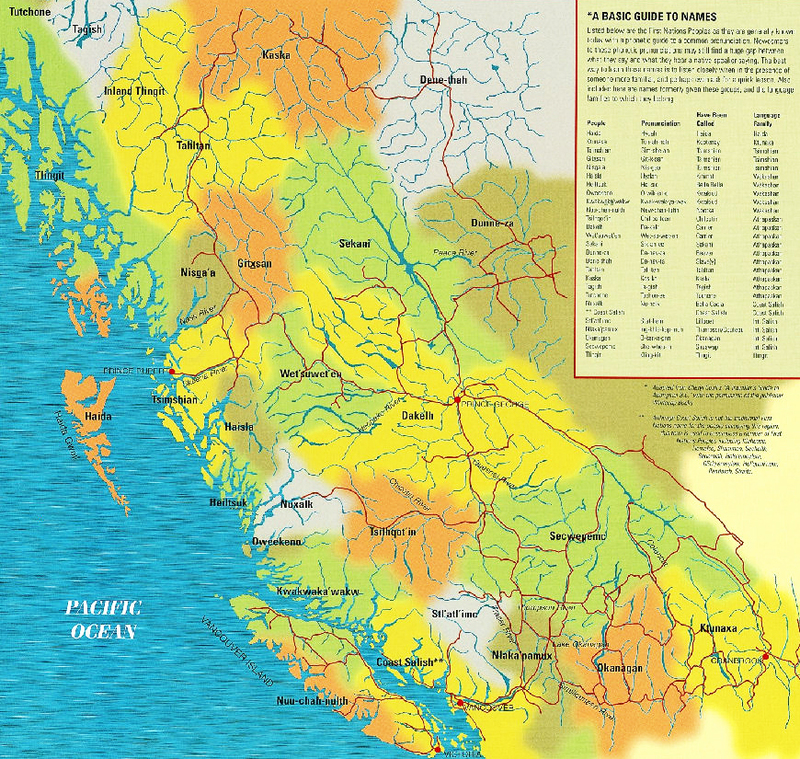 For a better look at the map of Native languages, courtesy of the BC Ministry of Education, click on the image. In the 1960s, the Carrier Linguistic Committee in Fort St James developed an alternative writing system based on the Latin alphabet. 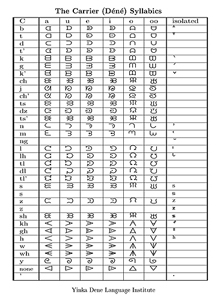 This system is now the most popular writing system for Dakelh. 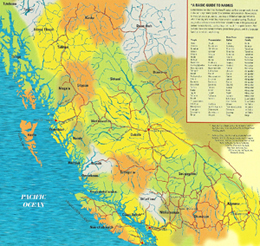 Dulkw’ahke (Carrier), an Athabascan language spoken by 3,600 people in central British Columbia, Canada. 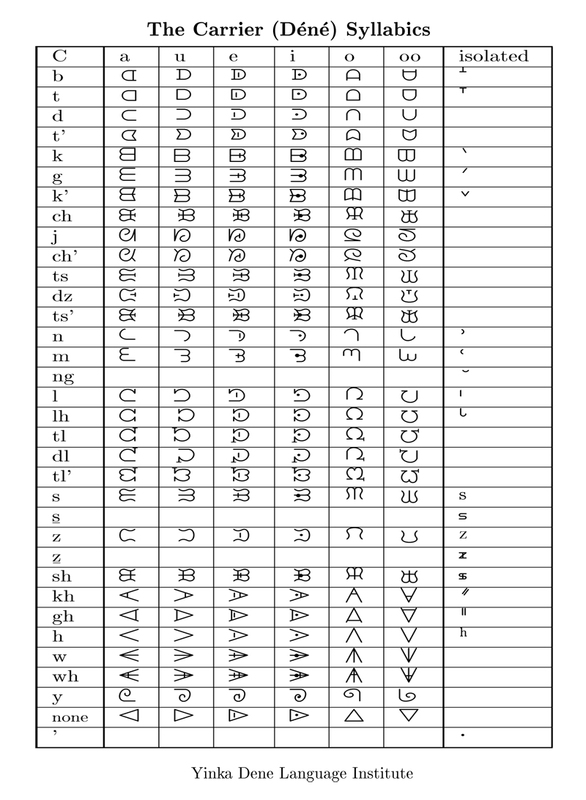 This syllabary has also been adapted to write a number of other indigenous languages of North American such as Cree and Inuktitut. The Carrier Linguistic Committee writing system is the one most widely used by Carrier people. It is based on the Roman alphabet, using letters and combinations of letters as in English where possible. The Morice Roman system is derived from the writing system used by Father Adrian Gabriel Morice in his scholarly publications and the third edition of the prayer book. To view a larger version of this list of Carrier Syballics, courtesy of the Stellat’en Archives, simply click on the thumbnail. daja what happened or where is?